ARES continues to conduct significant data collection and analysis pertaining to the illicit sale of arms and munitions via social media and communications platforms in conflict and post-conflict zones. From time to time, we will be featuring items of interest uncovered during our research, here on The Hoplite. 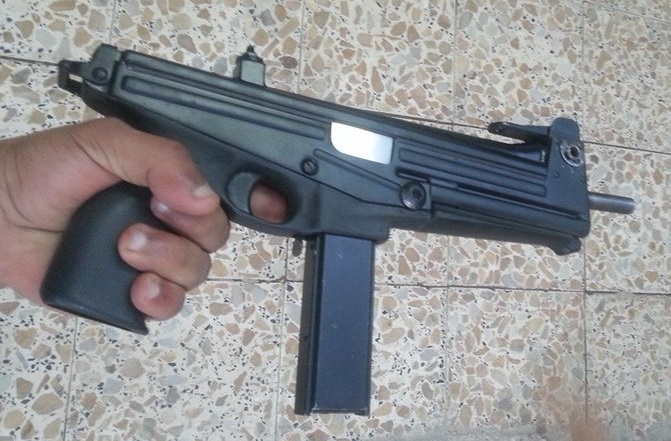 This rare Finnish sub-machine gun appeared on a social media platform group associated with the black market arms trade in Iraq in March 2016. 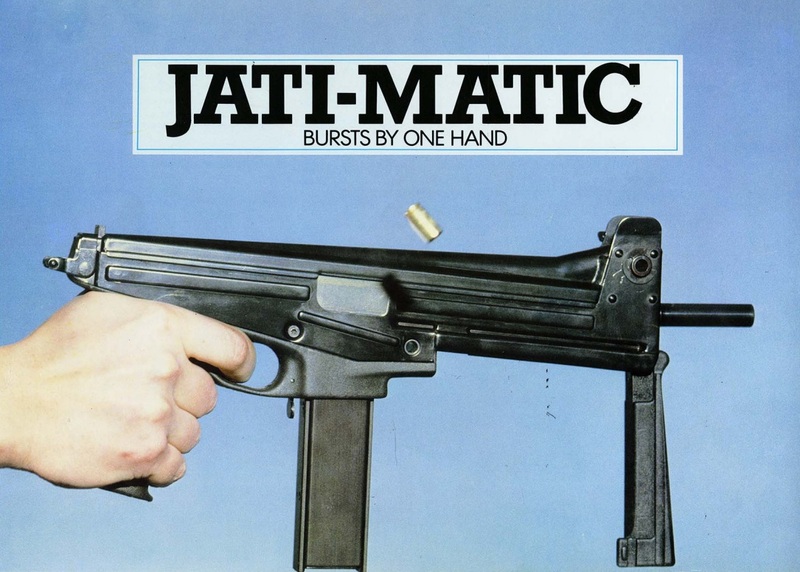 Originally stylised as ‘JaTiMatic’ (after the designer’s first name, surname, and ‘automatic’), the weapon is referred to in early English language marketing materials as the ‘Jati-Matic’, however later materials use ‘JatiMatic’, and the guns are marked ‘Jatimatic’. 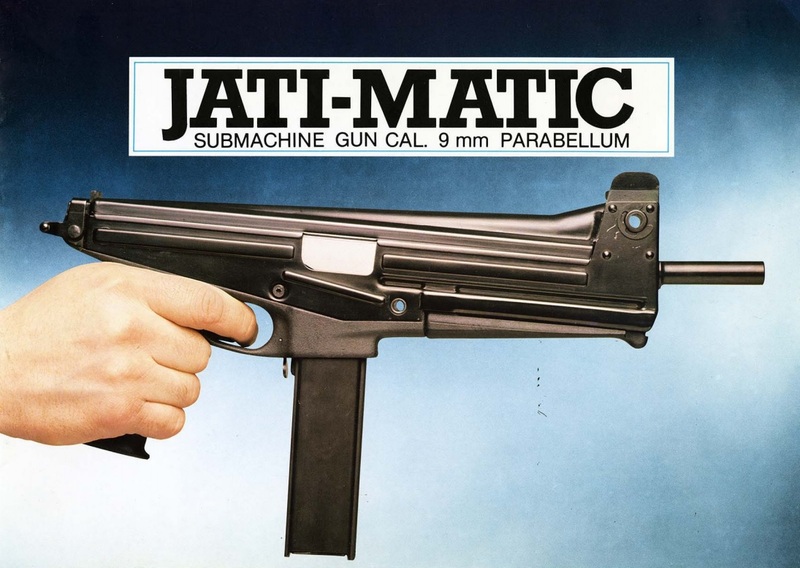 The Jatimatic is a compact 9 x 19mm submachine gun that fires from the open bolt position. 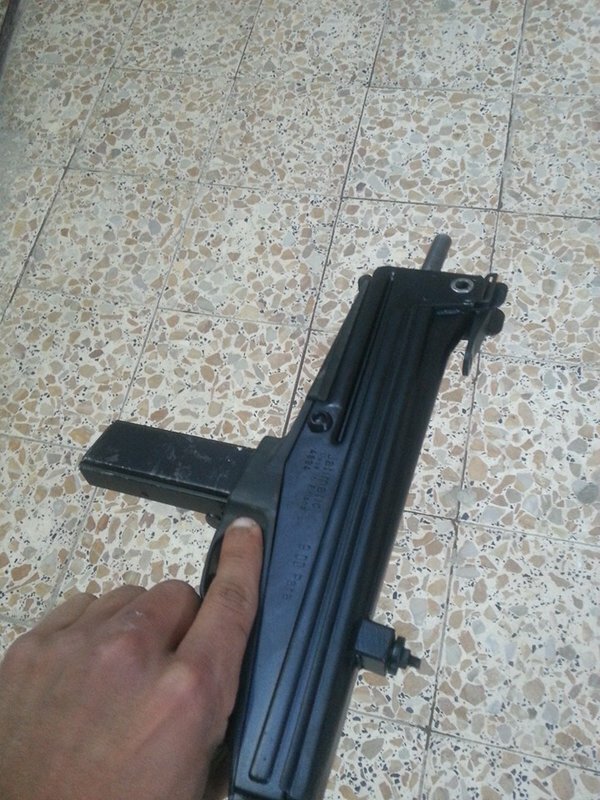 The weapon is not fitted with a buttstock, and features a novel collapsible fore grip that also acts as a cocking handle and safety. The Jatimatic is blowback operated and feeds from proprietary 20- and 40-round box magazines. Designed in the late 1970s and early 1980s, the Jatimatic was released in 1982 and was aimed primarily at the law enforcement and private security market. Limited numbers were produced by Tampereen Asepaja Oy in Finland, and examples were immediately imported to the United States by Omni Ordnance Inc. of Dallas, Texas. 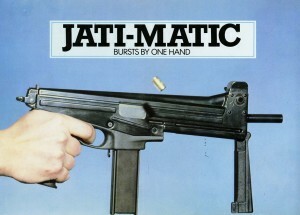 Jali Timari, the designer, had previously designed .22 LR calibre target pistols which served to prototype novel bolt design of the Jatimatic. 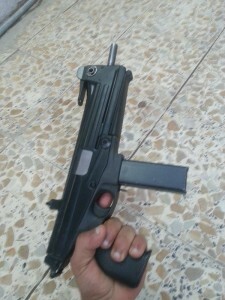 The design of the weapon’s operating mechanisms allows for a bore axis directly in line with the top of the pistol grip. It has been suggested that Jali Timari was influenced by the design of the Russian KBP Tula Central Design and Research Bureau of Sporting and Hunting Weapons (TsKIB SOO) MTs 3-1 Rekord target pistol, introduced in the mid-1950s, and featuring a very low bore axis (in line with the hand). The weapon features several innovative design elements that help to reduce felt recoil and muzzle rise, and to reduce the size of the gun. Notably, the weapon employed an inclined bolt that reduced muzzle climb and felt recoil by directing the bolt up and to the rear during firing and subsequently down and to the front to push the muzzle down (sometimes referred to as a ‘diverted recoil system’). This principle was known to French artillerists from the early 1700s, and is thought to have been brought to Finland by Augustin Ehrensvärdiä, who studied in France. In 1986, Jali Timari was granted a US patent for his design. The bolt carrier is machined to ride partially over the barrel in a fashion similar to the Czech Sa vz. 23 series submachineguns (sometimes known as a ‘telescoping bolt’). This reduces the overall length of the weapon while maintaining a reasonable barrel length for accuracy. A built in forward grip also acts as the cocking handle and mechanical safety. This feature helps reduce the profile of the weapon significantly and adds a very obvious safety mechanism; when the fore end is folded (stowed), the safety is engaged and the bolt is immobilised in either the forward or rearward position. 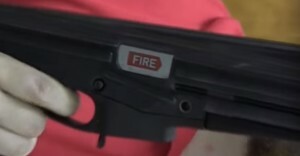 When the weapon is cocked, a portion of the bolt carrier marked with the word ‘FIRE’ is exposed through the ejection port. 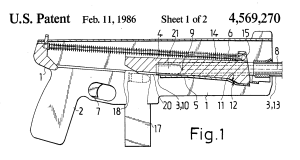 The Jatimatic features a polymer lower receiver, which was a relatively new trend at the time, paired with a stamped sheet metal upper. The weapon can also accept Carl Gustav m/45 or Smith & Wesson M76 magazines, with minor modification, and was offered for sale in the US with an early laser-aiming module and a Reflex brand suppressor. The Jatimatic made a brief reappearance in 1995 as the GG-95 PDW, offered for sale by the Finnish company Oy Golden Gun Ltd., after various legal and export issues. 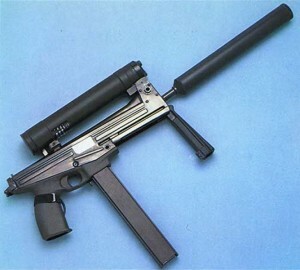 The Finnish Defence Forces acquired and trialled five Jatimatic type submachine guns in 1996, however the weapon was found unsuitable for military use. One notable flaw these trials identified is the possibility of accidentally disassembling the weapon whilst in use. The rear sling attachment point doubles as the take-down mechanism for the weapon, which seems a poor choice for a gun designed for concealed carry and not fitted with a buttstock – i.e. one often employed with a sling and fired under sling tension. The trial also identified issues with the sight picture, magazines, and winter performance. It is also possible to inadvertently cause a failure to feed if the weapon is cocked without maintaining forward pressure on the cocking handle/front grip, as the bolt will stop before fully chambering a round if you accidentally pull back on the cocking handle during this procedure. The GG-95 is also marked with a serial number on the left-hand side of the receiver and the Golden Gun company logo on the pistol grip. The earlier Tampereen Asepaja Oy model features no external fire selector (semi-automatic fire being achieved with a light trigger pull), whilst the GG-95 PDW features an external fire selector with positions marked ‘.’ and ‘…’ for semi-automatic and automatic. 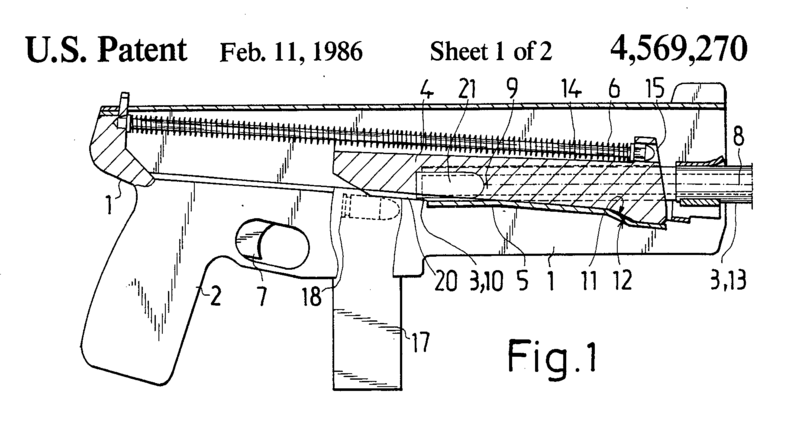 An over-folding (top-folding) metal buttstock was fitted to a limited number of Jatimatic type weapons, and additional buttstock conversions were made in the United States by some owners. Additionally, there appear to be limited numbers of Jatimatic series weapons which are not marked with ‘Jatimatic’, ‘JatiMatic’, or similar. At least one of these features a fire selector. The example documented in Iraq appears to have been posted by the owner for valuation and comment, possibly with the aim of selling it at a later date. It features a mounting point for a top-mounted laser-aiming module, which doubles as a rear sight in conjunction with a flip-up forward sight. The total number of Jatimatic submachine guns produced remains unknown, with various sources estimating between 200 and 400 were manufactured. The serial number range used for production is likewise unknown, with examples documented (including the example seen in Iraq) featuring 4-digit serial numbers beginning with ‘4’ or ‘5’. Little information is available on the international distribution of the weapon and it is believed they are held primarily by individuals rather than national forces, making the diversion of this weapon into the illicit sphere even more interesting. Love the weapon and the whole concept, I saw it in Stallone Cobra when I was a kid & have been fascinated by it ever since. Stallone made it look even cooler the way he handled it while gunning down the bad guys in the movie! He was the sh#t back then. I wished the weapon would have had more success being it had some real innovative features that could have been tweaked like making it a closed bolt system so it could be more civilian- friendly i.e. for folks like me. Hard to think of any reason why a civilian would need submachine gun, except looking like Stallone and cool. And that goal can be achieved by doing the gym and with a plastic replica. I mean in full automatic…..